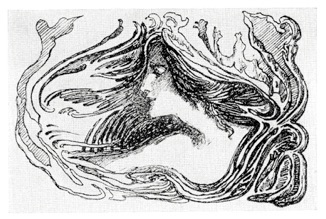 FRONTISPIECE IMAGE: LUDWIG VON HOFMANN’S 1897 ART NOUVEAU VIGNETTE FROM “PAN”. 1. T. S. Eliot, Four Quartets, “East Coker” III, 129. 2. Rabindranath Tagore, When She Passed By Me from The Gardener, No. 22, (NY: The Macmillan Company, 1913. Translated by the author from the original Bengali. <http://www.terebess.hu/english/tagore0.html>. 3. A closer variation on ‘between the froth and the water’ as described in Alwyn Rees and Brinley Rees, Celtic Heritage: Ancient Tradition in Ireland and Wales. (London: Thames and Hudson,1961), p. 345. 4. An extension of ‘neither this nor that’ as described in Ibid. 5. See more on this at Ibid., p. 346. 7. According to Arwin van Arum <http://members.chello.nl/~a.vanarum8/EliotProject/Eliot_life.htm>, this statement was made on the 24th of February, 1914 in a Philosophy class at Harvard taught by Josiah Royce. He cites Akroyd, Peter. T.S. Eliot. Penguin Books. London, 1984 as his source. While I do not in the least doubt the accuracy of the statement, I was unable to locate the citation in Akroyd. 8. Umberto Eco, The Mysterious Flame of Queen Loana. Geoffrey Brock, Translator. (Orlando: Harcourt, Inc., 2004), p. 6. 9. Umberto Eco, Foucault’s Pendulum. Translated from the Italian by William Weaver. (San Diego: A Helen and Kurt Wolff Book/ Harcourt Brace Jovanovich, Publishers, 1989), p. 226. 10. Rabindranath Tagore, When She Passed By Me from The Gardener, No. 22, op. cit. Translated by the author from the original Bengali. <http://www.terebess.hu/english/tagore0.html>. The author tells us in his Preface to the Macmillan edition, which is dedicated to W. B. Yeats, that “Most of the lyrics of love and life, the translations of which from the Bengali are published in this book, were written much earlier than the series of religious poems contained in the book named Gitanjali. The translations are not always literal---the originals being sometimes abridged and sometimes paraphrased.” This edition is available online at Google Books. 12. For more on W. B. Yeats, see: Tracy Boyd, “The Mythic Ground of the Longing For Wisdom and Love in William Butler Yeats’s The Song of Wandering Aengus” at <www.sacredthreads.net>. 13. W. B. Yeats, Introduction to Rabindranath Tagore, Gitanjali (Song Offerings): A Collection of prose translations made by the author from the original Bengali. With an Introduction by W. B. Yeats to William Rothenstein, 1913. <http://www.sacred-texts.com/hin/tagore/gitnjali.htm>. 17. Rabindranath Tagore, Stray Birds. No. 309. Translated from Bengali to English by the author. (New York: The Macmillan Company, 1916.) at <http://www.sacred-texts.com/hin/tagore/strybrds.htm>. 28. Rabindranath Tagore, Stray Birds. No. 107, op. cit., at <http://www.sacred-texts.com/hin/tagore/strybrds.htm>. 29. Mischa Richter for The New Yorker. 30. To refresh the memory: In the 1984 movie, 2010: The Year We Make Contact, from which we here quote, when astronaut Dave Bowman was suspended in space, investigating the mysterious monolith, he reported back in a voice of ecstatic child-like wonder: “My God! It’s full of stars!” He had just previously announced that he could see that something wonderful was going to happen, and warned, “You must leave.” He repeats that what is going to happen is “Something wonderful,” and then says, “. . . You see, it's all very clear to me now. The whole thing. It's wonderful.” Seconds later, SAL, the earth-bound twin sister (the voice-over is Candice Bergen!) of the supercomputer, HAL, afraid of what is going to happen, asks Dr. Chandra, in the most innocent voice imaginable, “Will I dream?” Chandra soothingly responds, “Of course you will. All intelligent beings dream. Nobody knows why.” When HAL, seconds later, asks, “. . .will I dream?,” this time, Chandra answers, “I don’t know.” (<http://www.imdb.com/title/tt0086837/quotes>. 32. Joseph Campbell, Assisted by M. J. Abadie. The Mythic Image. (Princeton: Princeton University Press, Bollingen Series C, 1974), I: The World as Dream, 1. The Lord of Sleep, Fig. 4, p. 6, and text, p. 7, and pp. 7-12 passim. 33. Hermann Hesse, Siddhartha. Hilda Rosner, Translator. (New York: New Directions Paperbook, 1957), p. 83. Siddhartha was originally published in 1922. 37. See: Joseph Campbell & Henry Morton Robinson, A Skeleton Key To Finnegans Wake. (New York: The Viking Press, 1944; Viking Compass Edition, 1961, 6th Printing, 1968), “The First Four Paragraphs of Finnegans Wake”, pp. 24-37. 38. James Joyce, Finnegans Wake. (New York: The Viking Press, Inc. Viking Compass Edition issued in 1959 with the author’s corrections incorporated in the text, Eighth Printing, 1968), “final” sentence: Part IV., p. 628. This is the text from which we quote throughout this article. 39. Ibid., “first” sentence, Part I.1, p. 3. 40. This response is typically found throughout the old version of The Book of Common Prayer of the Protestant Episcopal Church. 41. A spin on “Quick now, here, now, always––” from T. S. Eliot, Four Quartets, “Burnt Norton” V. 173. 42. T. S. Eliot, Four Quartets, “Little Gidding” V. 239-242. 43. T. S. Eliot, Four Quartets, “Burnt Norton” I. 1-3. 44. T. S. Eliot, Four Quartets, “Burnt Norton” I. 6. 45. T. S. Eliot, Ash Wednesday I. 46. A spin on “. . . mixing/ Memory and desire, stirring/ Dull roots with spring rain.” from T. S. Eliot, The Waste Land, “The Burial of the Dead” I. 2-4. 47. T. S. Eliot, Four Quartets, “Burnt Norton” I. 11-15. 48. T. S. Eliot, Four Quartets, “Burnt Norton” I. 27. 49. T. S. Eliot, Four Quartets, “The Dry Salvages” II. 93. 50. Letters of Rainer Maria Rilke 1910-1926. Trans. Jane Bannard Greene and M. D. Herter Norton. (New York: W. W. Norton & Company, Inc., 1947, 1948: The Norton Library, 1969), Rilke’s November 13, 1925 letter  to his Polish translator, Witold von Hulewicz, “further elaborating” his Elegies, Book of Hours, and Sonnets to Orpheus, p. 373; and passim, pp. 372-376. 51. Rainer Maria Rilke, “The First Elegy”, in Duino Elegies. J. B. Leishman and Stephen Spender, Translation, Introduction, Commentary. (New York: W. W. Norton & Co., 1939, 1967), lines 79-84, p. 25. The Elegies were begun in 1912 and finished in a rush of poetic fervor in a matter of days in February of 1922. For the incredible history of the writing of the Elegies and, simultaneously, the Sonnets to Orpheus, see Ibid., Intro., pp. 9-18.) We quoted these same lines in the context of the endless cycles of return as exhibited in the hand of The Fool of the 1JJ Swiss Tarot Deck. See: Tracy Boyd, “The Tarot Fool’s Hand” under the heading: “To Every Thing There Is a Season” at <www.sacredthreads.net>. 52. “In the beginning” is the opening line of The Book of Genesis. See: Tracy Boyd, “Wind Over Water: The Breath of Creation” at <www.sacredthreads.net>. 53. T. S. Eliot, The Lovesong of J. Alfred Prufrock, from Prufrock and Other Observations, 1917. 54. Rearrangements and direct quotations from T. S. Eliot, Four Quartets, “The Dry Salvages” V. 206-207; 205; 207; 210-212. 55. T. S. Eliot, Four Quartets,“Burnt Norton” V. 174-175. 56. James Joyce, Finnegans Wake, op. cit., Part I.1, page 3. 57. This is the warning of the thrush in T. S. Eliot, Four Quartets, “Burnt Norton” I. 42-43. 58. Umberto Eco, Foucault’s Pendulum, op. cit., p. 226. 59. James Hillman, The Force of Character: And the Lasting Life. (New York: Random House, 1999), p. 125, and pp. 125-131 passim. The preamble on the dedication page is a single line of T. S. Eliot’s from the last part of “East Coker”: “Old men ought to be explorers,” (T. S. Eliot, Four Quartets, “East Coker” V. 202.) which sets the perfect tone of Hillman’s frequent quoting from the Four Quartets throughout this marvelous book. 61. Rabindranath Tagore, When She Passed By Me from The Gardener, No. 22, op. cit., <http://www.terebess.hu/english/tagore0.html>. 62. T. S. Eliot, Four Quartets, “East Coker” V. 186-188. 63. William Butler Yeats, The Song of Wandering Aengus from The Wind Among the Reeds, 1899. Public Domain. See: Tracy Boyd, “The Mythic Ground of the Longing for Wisdom and Love in William Butler Yeats’s The Song of Wandering Aengus” at <www.sacredthreads.net>. 64. T. S. Eliot, Four Quartets, “East Coker” III. 123-28. 65. T. S. Eliot, Ash Wednesday, V.
66. T. S. Eliot, Four Quartets, “Burnt Norton” II. 62. 67. T. S. Eliot, Four Quartets, “Burnt Norton” II. 65: and II. 63. 68. T. S. Eliot, Four Quartets, “Burnt Norton” II. 66-69. 69. T. S. Eliot, Four Quartets, “East Coker” III. 146. 70. T. S. Eliot, Four Quartets, “Little Gidding” V. 250-251. 71. That state referred to in “Between Worlds” above, being a variation on ‘between the froth and the water’ in Alwyn Rees and Brinley Rees, Celtic Heritage: Ancient Tradition in Ireland and Wales, op. cit., p. 345. 72. William Shakespeare, The Winter’s Tale, IV. iii. 140-142. 73. T. S. Eliot, Four Quartets, “Burnt Norton” V. 137-38. 74. T. S. Eliot, Four Quartets, “Burnt Norton” V. 139-153. 75. T. S. Eliot, Four Quartets, “Little Gidding” V, 216-217. 76. T. S. Eliot, Four Quartets, “East Coker” III. 134-35. 77. T. S. Eliot, Ash Wednesday, I. 78. T. S. Eliot, Four Quartets, “East Coker” III, 129. 79. The poet rarely, if ever, eludes to his sources, a very glaring exception being the brief background Notes that he provided for The Waste Land, another, the cryptic fragments of Heraclitus which precede the Quartets, which we shall take up in detail later. It would seem that there is an entire industry devoted to the publication of articles, dissertations, books, and now, scholarly on-line sources, about T. S. Eliot’s various sources of mysticism. Among the best of the lot –if you can find them – is: [Sister] Corona Sharp, “‘The Unheard Music’: T. S. Eliot’s Four Quartets and John of the Cross”. University of Toronto Quarterly, 51 (Spring 1982. ); G. Schmidt, “An Echo of Buddhism in T. S. Eliot’s ‘Little Gidding’”, in N&Q, (Sept., 1973. ); Narsingh-Srivastava, “The Ideas of the Bhagavad-Gita in Four Quartets” in CL, (Spring, 1977. ); C. T. Thomas, “An Analogy from Hindu Mythology in Eliot’s Burnt Norton, II 16-23” in Expl. (Spring, 1980. ); Donald J. Childs, T. S. Eliot: Mystic, Son, and Lover. (Athlone Press, 2001. ); and the “must read” fascinating and brilliantly detailed study of Eliot’s lifelong deep involvement in and commitment to Indian studies by Cleo McNelly Kearns, T. S. Eliot and Indic Traditions: A Study in Poetry and Belief. (Cambridge: Cambridge University Press, 1987; Digitally Printed Version, 2008. 80. T. S. Eliot, Four Quartets, “Burnt Norton” V. 175. 81. A spin on “Footfalls echo in the memory/Down the passage which we did not take . . .” from T. S. Eliot, Four Quartets, “Burnt Norton” I. 11-12. 82. Lama Anagarika Govinda, Foundations of Tibetan Mysticism: According to the Esoteric Teachings of the Great Mantra Om Mani Padme Hum. (York Beach, ME: Red Wheel/Weiser, LLC, 1969), p. 22. 84. The Gospel According to Saint John 1:1. King James Version. 85. T. S. Eliot, Ash Wednesday, V.
86. Tracy Boyd, “Wind Over Water: The Breath of Creation,” at <www.sacredthreads.net>. 87. Joseph Campbell, Assisted by M. J. Abadie. The Mythic Image, op. cit., p. 356. 88. Lama Anagarika Govinda, Foundations of Tibetan Mysticism: According to the Esoteric Teachings of the Great Mantra Om Mani Padme Hum, op. cit., p. 47. 89. Ibid., p. 27. For an exquisite explanation of the chakras, see: Joseph Campbell, Reflections on the Art of Living: A Joseph Campbell Companion. Diane K. Osbon, Editor. (New York: HarperCollins Publishers, 1991), pp. 109-116. For somewhat fuller discussions of the sacred implications of OM and other related matters, including the Tao, The Gospel of John, yoga, the caduceus, and a host of other things, see: Tracy Boyd, “Wind Over Water: The Breath of Creation”; and Tracy Boyd, “Teiresias, The Androgynous Seer: A Question of Balance,” under the heading: A Question of Creation and the Transcendence of Opposites at <www.sacredthreads.net> from which we have borrowed some of the material here on OM. 90. T. S. Eliot, Ash Wednesday, I, and repeated in VI, to make sure we got it. 91. The I Ching or Book of Changes. The Richard Wilhelm Translation rendered into English by Cary F. Baynes; Forward by C. G. Jung; Preface to the Third Edition by Hellmut Wilhelm. (Princeton: Princeton University Press, Bollingen Series XIX, 1950-1969), Hexagram 52. Ken/Keeping Still, Mountain, p. 201, and passim pp. 200-204. 95. Book of Ecclesiastes 3:1. King James Version. This verse and the very familiar verses (2-8) that follow, which were sung repeatedly at all the Peace concerts during the Vietnam War, and thus made even more a part of us, are not reproduced here. You probably know them by heart anyway. Ecclesiastes dates to about the 3rd century B.C.E. 96. The I Ching or Book of Changes, op. cit., Hexagram 52. Ken/Keeping Still, Mountain, The Judgment, p. 201. 97. T. S. Eliot, Four Quartets, “The Dry Salvages” II, 101. 99. T. S. Eliot, Four Quartets, “The Dry Salvages” III, 129. 100. T. S. Eliot, Ash Wednesday I and VI. 101. J. D. McClatchy, “T. S. Eliot” Commentary in The Voice of the Poet. (New York: Random House Audio, 2005), p. 4. 103. Epigram 1 of T. S. Eliot’s Four Quartets cited as: 1. p. 77. Fr. 2 Diels: Die Fragmente der Vorsokratiker (Herakleitos). Translated by Tristan:<http://www.tristan.icom43.net/quartets/index.html> who accurately reproduces the Quartets on his beautiful website. It is a delight to read them there. 104. See: H. Diels, “Heraclitus”, Encyclopedia of Religion and Ethics. James Hastings, Editor. Twelve Volumes + Index. (New York: Charles Scribner’s Sons), Vol. 6, p. 594. 105. Epigram 2 of T. S. Eliot’s Four Quartets cited as: 1. p. 89. Fr. 60. Fr. 2 Diels: Die Fragmente der Vorsokratiker (Herakleitos). Translated by Tristan:<http://www.tristan.icom43.net/quartets/index.html>. 106. H. Diels, “Heraclitus”, Encyclopedia of Religion and Ethics. James Hastings, Editor. Twelve Volumes + Index. (New York: Charles Scribner’s Sons, ND), Vol. 6, p. 594, quoting and translating Heraclitus Fr. 103. 107. This is my translation from the Greek: ξυνὸν γὰρ ἀρχὴ καὶ πέρας ἐπὶ κύκλου περιφερείας. Transliteration: xunòn gàr archè kaì péras epì kúklou periphereías. The original Greek type and its transliteration, is courtesy of the hard, dedicated, and diligent work of Randy Hoyt, The Fragments of Heraclitus @<http://www.heraclitusfragments.com/files/g.html>. 108. Epigram 2 of T. S. Eliot’s Four Quartets cited as: 1. p. 89. Fr. 60. Diels: Die Fragmente der Vorsokratiker (Herakleitos), op. cit. 109. T. S. Eliot, Four Quartets, “The Dry Salvages” III, 129. 110. Eliot was rumored to have been so enamored of Buddhism that he almost became a Buddhist, but it was his immersion in the philosophies rather than the religious practice that interested him. (See: Stephen Spender, T. S. Eliot (Modern Masters). Frank Kermode, Editor. (New York, The Viking Press, 1976), p. 20. 111. See: Cleo McNelly Kearns, T. S. Eliot and Indic Traditions: A Study in Poetry and Belief, op. cit., pp. 21-29 to start, then just keep going. 112. T. S. Eliot, Four Quartets, “The Dry Salvages” III, 124-26. 113. Cleo McNelly Kearns, T. S. Eliot and Indic Traditions: A Study in Poetry and Belief, op. cit., p. 49. McNelly Kearns, T. S. Eliot and Indic Traditions: A Study in Poetry and Belief, op. cit., pp. 239-43; and the section on “What Krishna meant,” pp. 247-254. 115. T. S. Eliot, Four Quartets, “The Dry Salvages” III, 170. 121.T. S. Eliot, The Love Song of J. Alfred Prufrock, Prufrock and Other Observations, 1917. 123.T. S. Eliot, Four Quartets, “East Coker” V, 209. 124.See, for example: Tristan, “Notes” to Four Quartets, June 2000 @ <http://www.tristan.icom43.net/quartets/notes.html>, or Stephen Spender, T. S. Eliot (Modern Masters), op. cit., p. 171, who gets it backwards! 125.T. S. Eliot, Four Quartets, “East Coker” V, 209. 126.Ibid., I, 1. At the end of Tracy Boyd, “The Tarot Fool’s Hand”, which itself is all about the commonality of beginning and end, I made mention in a footnote that “In My End Is My Beginning” is Thomas Merton’s title for Chuang Tzu’s “Heaven and Earth”, a literal translation of which is found in The Writings of Chuang Tzu, Book XII, Part II, Section VIII at <http://nothingistic.org/library/chuangtzu/toc.html>. See: The Way of Chuang Tzu. “Free interpretative readings” by Thomas Merton. (Boston: Shambhala Publications, Inc., 1992), pp. 112-113. His title, of course, pays direct homage to Mr. Eliot. 128.See, for example: Umberto Eco, The Mysterious Flame of Queen Loana, op. cit. 131.Rosemarie P. McGerr, Chaucer’s Open Books: Resistance to Closure in Medieval Discourse, op. cit., pp. 28-29, quoting and translating Guillaume de Machault, Poesies lyriques, 2:575. 132.T. S. Eliot, Four Quartets, “East Coker” I, 1. 134.Rosemarie P. McGerr, Chaucer’s Open Books: Resistance to Closure in Medieval Discourse, op. cit., p. 29, translating Guillaume de Machault, Poesies lyriques, 2:575, then presenting her analysis of the musical score. The phrase “mise en abime” has a very interesting history in the discussions of art history and literary theory. “The commonplace usage of this phrase is describing the visual experience of standing between two mirrors, seeing an infinite reproduction of one's image.” (<http://en.wikipedia.org/wiki/Mise_en_abime>) Because we will need to take a breath here and there, the paragraph breaks are our own doing. 137.Correction: It is not the same. It is a continuation from where the last word left off, as we have shown above. However, Eco’s conclusion is not effected by his error. 138.Rosemarie P. McGerr, Chaucer’s Open Books: Resistance to Closure in Medieval Discourse, op. cit., p. 29, quoting Umberto Eco, Open Work. (Cambridge, MA: Hutchinson Radius, 1989), p. 24, and 74. The paragraph break is ours. 139.Rosemarie P. McGerr, Chaucer’s Open Books: Resistance to Closure in Medieval Discourse, op. cit., p. 29. Citing: Wolfgang Iser, The Implied Reader: Patterns of Communication in Prose Fiction from Bunyan to Beckett. (Baltimore: Johns Hopkins University Press, 1974. Once again, the paragraph break is ours. 140.See: Fragments: The Collected Wisdom of Heraclitus. Translated by Brooks Haxton. Foreward by James Hillman. (New York: Viking Penguin/Penguin/Putnam, 2001), Note re Haxton’s Fragment number.41, pp. 95-96. We do not recommend this renumbered, inaccurately translated “free verse” pop-culture edition. Instead, we highly recommend the online site of Randy Hoyt at <http://www.heraclitusfragments.com/files/ge.html>. 141.Translation of Fragment 49A by Hermann Diels, “Heraclitus”, Encyclopedia of Religion and Ethics, op. cit., Vol. 6, p. 593. For more on Heraclitus, see: <http://en.wikipedia.org/wiki/Heraclitus> ; See also, <http://en.wikipedia.org/wiki/Temple_of_Artemis>. At some point in time future, an article on Artemis/Diana by Tracy Boyd will appear at <www.sacredthreads.net>. 143.Joseph Campbell & Henry Morton Robinson, A Skeleton Key To Finnegans Wake, op. cit., Foreward, p. x. 146.See: Joseph Campbell & Henry Morton Robinson, A Skeleton Key To Finnegans Wake: Unlocking James Joyce’s Masterwork. Edmund L. Epstein, Editor/Forward. Collected Works of Joseph Campbell. Joseph Campbell Foundation. (Novato, CA: New World Library, 2005), p. 131. 147.James Joyce, Finnegans Wake, op. cit., p. 196. 148.T. S. Eliot, Introductory Note, Introducing James Joyce: A Selection of Joyce’s Prose by T. S. Eliot with an introductory note. (London, Faber and Faber Ltd., First published September Mcmxlii (1942), Sixth impression, pp. 6-7. 150.James Joyce, Anna Livia Plurabelle. (London: The Faber Library, No. 25, 1997), inside front flap. 151.For the telling of the brief story and an in-depth discussion of Finn mac Cumhail, see: Tracy Boyd, “Titania, the Queen of Faerie, and the Druid Tom Thumbe” under the heading: “‘The Salmon of Knowledge’, the ‘Hazel of Wisdom’, and the ‘Thumb of Knowledge’” at <www.sacredthreads.net)>. 152.Joseph Campbell & Henry Morton Robinson, A Skeleton Key To Finnegans Wake: Unlocking James Joyce’s Masterwork, op. cit., p. 346. 153.James Joyce, Finnegans Wake, op. cit. Cannot locate the page, but this was quoted in the midst of a lengthy and very illuminating discourse on the Wake by Terence McKenna at: <http://fusionanomaly.net/surfingonfinneganswake.html>. We note that Campbell and Robinson remark in a footnote that “The strong play on the salmon theme throughout Finnegans Wake corresponds to the importance of the salmon in Irish myth and folklore. It was from the taste of the flesh of the great, wise salmon that Finn MacCool, according to the ancient tale, acquired his ‘Tooth of Knowledge’.” (Joseph Campbell & Henry Morton Robinson, A Skeleton Key To Finnegans Wake: Unlocking James Joyce’s Masterwork, op. cit., p. 133, Note*.) As we have detailed in “Titania, the Queen of Faerie, and the Druid Tom Thumbe” cited above, this is really his ‘Thumb of Knowledge’ that he places against his tooth. For more on the notoriously famous association of the hazel with poets, magicians, and seekers of wisdom, see:“Tracy Boyd, “The Mythic Ground of the Longing for Wisdom and Love in William Butler Yeats’s The Song of Wandering Aengus” especially under the heading: “The Hazels of Poetic Wisdom and the Salmon of Knowledge” at <www.sacredthreads.net)>. 154.James Joyce, Anna Livia Plurabelle, op. cit., inside front flap. 155.For the telling of the long story and an in-depth discussion of Boann, or Boand, see: “Tracy Boyd, “The Mythic Ground of the Longing for Wisdom and Love in William Butler Yeats’s The Song of Wandering Aengus” under the heading: “The Waters of the Left-Hand Path” at <www.sacredthreads.net)>. 156.Edward Gwynn, Metrical Dindshenchas, “Boand I”, Vol. 3., 1925, unpaginated, at <http://www.shee-eire.com/Magic&Mythology/Myths/Tuatha-De-Danann/Dindshenchas-Boand/Page1.htm>. 157.Alwyn Rees and Brinley Rees, Celtic Heritage: Ancient Tradition in Ireland and Wales, op. cit., p. 30. For more on Brigid, see: Tracy Boyd “The Keepers of the Flame: Vesta and Her Brides” under the heading “Brigit’s Birth-Fires” at <www.sacredthreads.net>. 158.<http://cannabisnews.com/news/5/thread5337.shtml> culled from The New York Times Obit of April 9, 2000. 159.Terence McKenna, Surfing on Finnegans Wake & Riding Range With Marshall McLuhan. (New York: Mystic Fire Audio, Audio Cassette ISBN: 1561769118, October 1995.) Transcript at <http://fusionanomaly.net/surfingonfinneganswake.html> Tape at <http://www.lancerules.com/terence/finneganswake.mp3>. 160.James Joyce, Ulysses. (New York: Vintage Books/Random House, First paperback edition, 1961; with additional pagination from the 1934 edition), p. 783. These words were written between 1914-1921. 161.James Joyce, Finnegan’s Wake, op. cit., p. 628. 162.Michael Dames, Mythic Ireland. (London: Thames and Hudson Ltd, 1992), p. 128, who describes the geographic features of Dublin that inspired this scene. 164.James Joyce, Finnegans Wake, op. cit., p. 619. 166.T. S. Eliot, Four Quartets, “The Dry Salvages” II, 79. 167.T. S. Eliot, Introducing James Joyce: A Selection of Joyce’s Prose by T. S. Eliot with an introductory note, op. cit., Introductory Note, p. 7. 169.James Joyce, Finnegans Wake, op. cit., “first” sentence, p. 3. 170.Samuel Beckett, “Dante... Bruno. Vico.. Joyce” in James Joyce/Finnegans Wake: A Symposium: OUR EXAGMINATION ROUND HIS FACTIFICATION FOR INCAMINATION OF WORK IN PROGRESS, op. cit., p. 14, and pp. 3-22. 171.Joseph Campbell, Mythic Worlds, Modern Words: On the Art of James Joyce. Edmund L, Epstein, Editor. Collected Works of Joseph Campbell. First Edition. (New York: HarperCollins Publishers, 1991), p. 233, quoting James Joyce, Finnegans Wake, op. cit., p. 626. 172.Joseph Campbell, Mythic Worlds, Modern Words: On the Art of James Joyce, op. cit., p. 233. 173.James Joyce, Finnegans Wake, op. cit., p. 626. 177.Michael Dames, Mythic Ireland, op. cit., p. 128. 178.Joseph Campbell and Henry Morton Robinson, A Skeleton Key To Finnegans Wake, op. cit., p. 10. 182.Rabindranath Tagore, “Unending Love”, in Manasi (The Heart’s Desire: A Collection of Poems), 1890 <http://www.calcuttaweb.com/tagore/chronology.shtml> on line at <http://oldpoetry.com/opoem/33293-Rabindranath-Tagore-Unending-Love>. fying glass over a frenzy of tiny insects running to and fro to get a closer look and the tiniest little aphid stretches up on its hind legs, places its little hands on the underside of the glass, looks you right in the eye and gives you a very thorough going over. Pow! You are there. Although this place that one can dwell in is nowhere, in reality, its exact position can be delineated as the point at the absolute center of all possible opposites, that space that is no space in which “wisdom, poetry, and knowledge are revealed.” (6) This nowhere place of everything and nothing exists at a point in time in which past, present, and future seamlessly merge. Is this a dreamworld which exists only in the mind and body and soul? Or is it the real world? T. S. Eliot who, as early as 1914, “criticize[d] all theories of knowledge for their inability to ‘treat illusion as real’,” (7) has much to say about this in his Four Quartets, as does James Joyce in Finnegans Wake, and Umberto Eco in nearly everything he writes – a man of such amazing imagination that he muses upon such things as “the desperate loneliness of parallel lines that never meet.” (8) This kind of thinking suggests that perhaps this dreamworld has at least one foot in reality. the end of her skirt touched me. came a sudden warm breath of spring. torn flower petal blown in the breeze. In this dreamworld that Tagore has so perfectly captured – a universe that is somehow remarkably familiar to us –, all sentient beings dream. Even flowers dream. The Sun and Moon have feelings. Raging storms are given voice in the most natural of ways. All of this seems perfectly normal. There is nothing strange about it at all. It is quite real. We find ourselves feeling the deepest joys and sadnesses for birds and flowers, stars and clouds who are but ourselves. This is especially the case in the poet’s “philosophical epigrams,” Stray Birds, (16) where human feelings are indistinguishable and inseparable from those of the elements of the natural world and the forces of nature. We are thus enfolded into a very comfortable universe where everything is everything else. One has even to wonder whether we might have inhabited such a world in some blissful distant past. It was a most appropriate question for the time. But, in truth, it is the penultimate question for all time. After all, we must pause to wonder why, in an ultra-sophisticated culture such as ours, an audience would be moved to tears over a question posed by a very brave but clearly frightened supercomputer who is about to face death. That oft-quoted question, of course being, “Will I dream?” The soothing, matter-of-fact, “Of course you will. All intelligent beings dream. Nobody knows why.” (30) response, which is greeted with equally audible “aawhs” all around, should also be cause for wonder. But somehow, inexplicably, it all seems perfectly reasonable. We know from more down-to-earth civilizations that the world of dream is a world of super-reality which informs all waking actions. But beyond that is the underlying question of whether the whole thing isn’t just a dream. There is such a sense of unreality about life sometimes. are dreaming too, has in India enchanted and shaped the entire civilization. laughing and lamenting voices, hundreds of voices, thousands of voices. And thus, does Finnegan begin . . . again. Seconds later, Eliot tells us that there is no going back to sort it all out, that “what might have been is an abstraction.” (44) He had warned us in Ash Wednesday about this tendency we mortals have of looking back with wistful fondness on the past, deliriously indulging ourselves in a kind of homesickness that puts us in such a pleasant state that we experience culture shock when we snap out of our reverie to return to what is here now. He awakens us to the reality that “you can’t go home again” for the simple reason that it is not there anymore. Although we must return again and again to hear – and for the first time – “the unheard music”, (48) it is not so that we can change the past – as we sometimes do in a dream when the ending is not quite to our liking. We make this journey to sort out those myriad events of past for which “we had the experience but missed the meaning” (49) so that we can truly know ourselves for the first time. At times, though, it is the past itself, bidden or unbidden, which overtakes us. Such was the case with a very wise, very old woman, a dear friend who was the anony-mous figurehead of a well-known movement of metaphysical thinkers. She was somewhat puzzled by the fact that, lately, she was seeing faces, – not just in sleep, but in waking, – visions of many faces appearing and disappearing right before her eyes as though they were standing directly in front of her – faces of people that she had known, and who were long dead. What did I think of all of this, and had I ever experienced such visions? who preceded us, to our origins and to those who seemingly come after us. I can remember it as though it was yesterday. This return to the magic of the idyllic garden, “past Eve and Adam’s,” as James Joyce would have it, (56) begins as a solitary dreamworld journey that can only be taken alone. It is not one of those superficial, saccharine-filled trips down memory lane, and because it is not, and because “human kind/Cannot bear very much reality,” (57) many will find themselves muttering, along with Umberto Eco’s character Casaubon, “I wish she were here, to hold my hand while I recon-struct the stages of my undoing.” (58) But this is a journey of self-awakening. In a very insightful book about growing old, The Force of Character: And the Lasting Life, we are told by its author, the elder statesman of archetypal psycho-logy, James Hillman, that the journeying of the mind back to one’s younger years is “a calling to return to that time when the heart opened so utterly.” (59) He says of this irresistible urge, this absolute compulsion, that it is often “a call so strong that in late life a failed date of half a century earlier becomes a sudden successful reunion, a marriage.” (60) Whatever the end result, there is no question that such backwards glances will occur, even if one ends up taking great pleasure in memory only, of that one unforgettable split-second moment in time that took one’s breath away for ever more. So, let us be clear. This keeping still – this dance – is not to be confused with stagnation, nor with the silence of finality. It is nothing of the sort. Rather, it has to do with suspension in time and space, with the infinite movement of sound, with the way “words move,” the way “music moves,”: the way they move “only in time,” (73) the way the vibrations resonate and linger in the air – still, yet moving. say, is heard from within, within oneself and simultaneously within space. There is perpetual movement in the Quartets, beginnings and endings of things in constant flux, moving and not moving in a timeless eternity, an eternity which is, by definition, ‘without beginning or end’. These are the lessons of impermanence and change never easily digested, hard to look at with anything approaching a semblance of objectivity. Perhaps we lacked the courage to take that long “backward look” (97) at “the moments of agony,” (98) or if we did dissect every aspect of past, missed something along the way, and so failed to realize what it was, exactly, that transformed such a glorious time of blissful beginning to such a bitter ending. The first epigraph, “Although logos is common to all, most people live as if they had a wisdom of their own,” (103) is far more related in tone to the circularity of the Word of Ash Wednesday and its inspiration from the Gospel of John, over which Heraclitus was said to have had a profound influence. (104) It bears little relevance to the circular threads of beginnings and endings that run throughout the Quartets. The second epigraph, “The way upward and the way downward are the same,” (105) which by now, is almost part of the vernacular, is very much in keeping with that unbroken circle of thought. on to the primordial principle. ‘For in rotation the beginning and the end are common’.” (106) Perhaps the more precise meaning, which in the original Greek has to do with the revolution of time as well as space – a subtlety of language about which Eliot had complete understanding – would be “For the circumference of a circle, the beginning and the end are shared in common.” (107) But the poet, curiously, makes no acknowledgement of his indebtedness to Heraclitus with respect to any of his numerous epigraphic fragments that focus, quite specifically, on the concerns of the seamless infinity of such beginnings and endings. Instead, he focuses on the philosopher’s fondness for a different sameness of things in opposition. With Eliot’s dexterous handling of all things of a philosophic nature, the second epigraph, “The way upward and the way downward are the same,” (108) having to do with direction rather than the beginnings and endings of things, is expanded to encompass all directions, thus becoming: “And the way up is the way down, the way forward is the way back.” (109) It would appear that the distinctly different ways of looking at the situation are the same anyway. Aren’t they? For if everything is the same as everything else, most particularly those things in direct opposition, then, in the end, everything is the same as everything else. He outdoes Heraclitus in each and every instance in which he touches upon his thinking. With this distant question, we are interrupted from our morose thoughts, drawn instead, into the mythical dreamworld of the Bhagavad-Gita, the “Holy Song as Eliot called it . . . embedded in the epic Mahabharata,” (113) forced to go back in memory or to our bookshelves to have another look at, or learn for the first time, what it was that Krishna said “when he admonished Arjuna/On the field of battle.” (114) And this, while we are in the wrenching process of examining what it was that went wrong in our own lives. But this lesson in moving forward is not reserved for Arjuna. It is for us, too, – especially for us. And even as this meditative poet persuades us with every image that he conjures, to take those backward glances, the ultimate goal is to “fare forward, voyagers.” (115) He asks that while we are moving forward in some place out of time, “At the moment which is not of action or inaction,” (116) that we “consider the future/And the past with an equal mind.” (117) And he gives us very fair warning about the reality that we will find on “the way down” and “the way back,”: (118) “That time is no healer: the patient is no longer here.”; (119) “You are not the same people” (120) who you were in that long-ago past. Returning to the subject of Eliot’s purposeful omission of his debt to Heraclitus’s circular thinking about beginnings and endings, we must conclude that although Eliot is fully cognizant of the Greek philosopher’s ideas in this regard, and certainly they are floating around in Eliot’s mind – and in these pages of poems –, he has not here taken Heraclitus as his original starting point. But, like the “hands/That lift and drop a question on your plate,” (121) we have been called upon to revisit the fragments of an ancient wisdom long forgotten, as we were with that question about what Krishna meant. And having taken the poet’s “overwhelming question[s]” (122) to heart, we have come to a deeper understanding of the music of the Quartets – and of our own song. Having eliminated Heraclitus as the inspiration for the now-famous line: “In my end is my beginning,” (123) we can say – with an assured degree of certainty – that his source is not to be found in the place that Eliot scholars seem to have unanimously attributed it to, namely, to “the motto of Mary Queen of Scots (‘En ma fin est mon commencement’).” (124) There is no doubt that it is an exact translation of the Queen’s phrase, but it is neither the source for Eliot – regardless of the fact that a reference to its having been her motto was found scrawled on a scrap of paper somewhere among his notes – nor is it original to the Queen. His source, as hers, is to be found elsewhere. “In my end is my beginning,” (125) is the very last line of “East Coker”, the perfect circular ending to the first line of this Quartet’s “In my beginning is my end.” (126) The two are inextricably inter-twined, inseparable mirror opposites, and they are from a single source whose origin predates Mary Queen of Scots by some two hundred years. The origin of these paired phrases is to be found in a composition of the French poet and composer Guillaume de Machaut (ca. 1300-1377), who was extremely well-known in his time as the author of a considerable number of masterworks of music and, additionally, of poems in their own right that were “greatly admired and imitated by other poets, including Geoffrey Chaucer.” (127) Although his is not exactly a household name in our own time, except perhaps for Medievalists, any Queen whose mother (Mary of Guise) and grandmother (Antoinette de Bourbon) were French would have been intimately familiar with the poetry and music of Guillaume – even centuries later. As for T. S. Eliot, we shall shortly provide incontrovertible evidence that Guillaume de Machaut’s “Ma fin est mon com-mencement” is the only possible source for the opening and closing lines of “East Coker”. Now, if this discovery is not tantamount to the finding of the First Folio of Shakespeare’s works that Umberto Eco is always going on about, then I’m dreaming. (128) “Ma fin est mon commencement,” the fourteenth rondeau on the composer’s own list of his musical works, compiled for the purpose of showing the order in which he wished them always to be performed, (129) is an intricately enfold-ed musical joke which has as its basis, a very long-standing Medieval dispute con-cerning circularity in poetic structure. Here is the original lyric followed by a word for word translation, both courtesy of Rosemarie McGerr, a brilliant and dedicated scholar of the Middle Ages, a Chaucer specialist who, apparently, has no idea whatsoever, or doesn’t care, that Eliot has since made Guillaume’s words even more famous than he could have ever hoped they could become. No one else has put this together either – not even the illustrious Medievalist Umberto Eco, the master of such connections! Perhaps as an allusion to his primary source, Eliot not only begins “East Coker” with “In my beginning is my end,” (132) thus reversing Guillaume’s opening line, and then ends with Guillaume’s opening line, “In my end is my beginning,” but, just so we get the point, which we most certainly did not, he drops a hint in the last of these opening thirteen lines about someone else who memorialized the rondeau in a “tattered arras woven with a silent motto.” (133) That, of course, would be Mary Queen of Scots. He seems to be having a bit of fun at us. lyric upside down because the music for this part must be read backward. voice “reverses itself three times and then ends”). This sounds like a script for one of Victor Borge’s brilliant comedy routines at the piano – William Tell Backwards comes to mind. (135) But the literary argument with respect to closure, “the linkage between the beginning and ending of a text,” (136) is a very serious issue to which this rondeau responds, and it is one that is still very much under discussion more than eight hundred years later! Although Mr. Eliot is not included in McGerr’s all-too-brief, but exceptionally illuminating conversations about “open and closed poetics” in the works of modern authors, James Joyce’s Finnegans Wake, as seen through the eyes of Umberto Eco, is the subject of her very next paragraph. Now, if that doesn’t sound like a line from T. S. Eliot, nothing does. Among the thousands and thousands of sources which can be cited in Finnegans Wake, there is one that, for obvious reasons, stands out above all, and that is the ancient tale of Fionn, or Finn mac Cumhail (‘Fair Son of the Hazel’), the boy-hero of Irish myth whose name is echoed throughout the novel whose very title bears his name. (151) It is told in the Irish saga of Fionn, that before the waters of the goddess Boann welled-up, flowing over to form the River Boyne, there was only a magic well, famed among Druids. The sacred well was shaded by nine magic hazel trees whose crimson nuts dropped into the water and were eaten by the salmon who thus gained knowledge of all things, and when the salmon were themselves partaken, the wisdom of the world was thus obtained. The Irish tend to name their rivers after goddesses. Such was that of the Anna Liffey that flows through Dublin. There is nothing unusual about that. But there is only one river in all of Ireland with a history of other famously revered “river names and associations” (154) attached to it in the same manner as that which flows through James Joyce’s Wake of watery magic. And that is the river of the goddess Boann, whose own saga, like Finn’s, begins at this magic well of inspiration. (155) Boann’s dramatic tale, which is the story of the bursting forth of the well in response to her triple circumambulations trod in a left-hand widdershins path, is related in a number of texts which Joyce must surely have read – and loved. Always looking at the world from the other side of things, the misguided genius, Terence McKenna, counterculture hero, ethnobotanist, and psilocybin mushroom promoter, who memorized passages from James Joyce in his youth before the days of his drug consciousness, and years later, named his son Finn, (158) shared some of his thoughts about Anna Livia Plurabelle at a conference at Big Sur’s Esalen Institute in 1995.
cares. . . . Anna Livia is always there, she’s always there. “So soft this morning, ours. Yes.” (161) is the quiet calm atmosphere that the river herself describes in her soliloquy that ends, or begins, Finnegans Wake “with Anna Livia slipping Finn, her lover, in again, as she enters the bay at Ringsend,” (162) moving, moving ever so slowly, as she wends her way out to sea. We are so accus-tomed to the predilection for shapeshifting that is so naturally present throughout the Wake, and so fondly remembered from the myths and folklore of our childhoods and beyond, that we are hardly aware of the smooth subtle sea-change that Anna is in the process of undergoing. It is the dawning of a new day as the river goddess “runs through Dublin into Dublin Bay to meet the sun-god hero Finn,” (163) drifting out to the salt-sea ocean on this “soft morning,” (164) dreaming, and not dreaming. slip away before they’re up. They’ll never see. Nor know. Nor miss me. over his feet, humbly dumbly, only to washup. Yes, tid. There’s where. First. We pass through grass behush the bush to. Whish! A gull. Gulls. Far calls. Coming, far! End here. Us then. Finn, again! Take. Bussoftlhee, mememormee! Till thousandsthee. Lps. The keys to. Given! Thus does Anna Livia Plurabelle drop off in mid-stream, so to speak, only to begin again at the very same point at which her sentence has peacefully drifted away. “There is no end of it.” (166) There is only the natural rhythm of the river’s flow that closes and opens all that we have experienced. It is a rapturous moment of ending and not ending. We can be sure of her state because, as Samuel Beckett has stressed about the aliveness of James Joyce’s writing, “When the sense is sleep, the words go to sleep. . . . When the sense is dancing, the words dance.” (170) And so forth. So, if we follow the sense, then, everything becomes clear. At the end which is not end, the state of Anna Livia’s awakeness depends entirely upon how far back one goes in her soliloquy. Things are changing sentence by sentence. And there are layers and layers of meaning in-between.